The Chemical and Biological Engineering (CHBE) Sustainability Club has developed a methodology to assess the sustainability of a large institution. The framework methodology allows for an assessment of the sustainability of an entire institution, such as UBC, through examination of the institutions sub-divisions or entities including: individual departments, research institutes and/or faculties. With the developed framework, these units will be able to perform their own assessment according to their internal capacity. The methodology utilizes two levels of indicators. A base level targets individuals in each unit and their personal sustainability. This is measured using an online or paper survey distributed through the department, institute or faculty communities. The second level of measurement is used to measure the sustainability of each entities operation. This would be completed by motivated individuals, such as sustainability coordinators or student groups. These measurements would be conducted by the environmental/sustainability administrative body within the institution, at UBC-Vancouver, this would most likely be conducted by the Campus Sustainability Office. The series of indicators is based on an number of leading frameworks, such as the Campus Sustainability Assessment Framework (CSAF) and the Sustainability Tracking, Assessment & Rating System (STARS). As well, UBC specific strategies were utilized, such as the Inspiration and Aspiration Guidelines and the Sustainability Academic Strategy. The concept of sustainability is continually evolving. The famous Brundtland Commission of the United Nations laid down the foundation of the concept as follows: “sustainable development is development that meets the needs of the present without compromising the ability of future generations to meet their own needs”. The project Realizing Sustainability Assessment aims to not only measure sustainability, but also to educate individuals about the various dimensions of sustainability. The Brundland definition led to the question of how to achieve this. 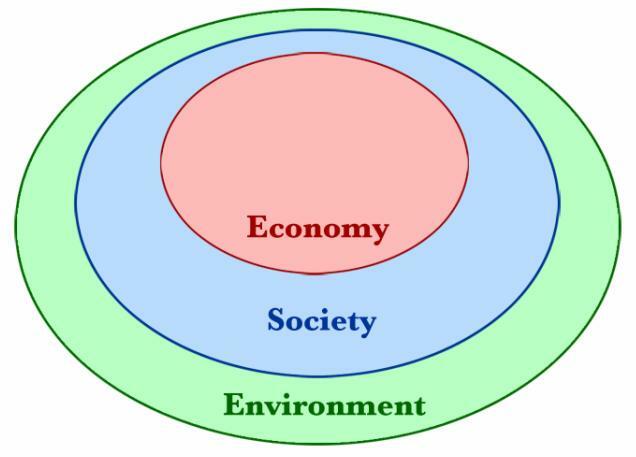 The 3 pillars, or triple bottom line model was then proposed and is still largely used today. The overlapping circles brought the concept of balance between economic, social and ecological imperatives. But this model can be challenged, because it gives equal importance to each of the three pillars. No economy can exist without people and people cannot live without basic needs of water, air and food provided by the environment. In light of this a nested model seems more appropriate. Being sustainable, means to live within the capacity of our environment, maintain a functioning peaceful society and use the economy as a tool to enhance our lives and opportunities. 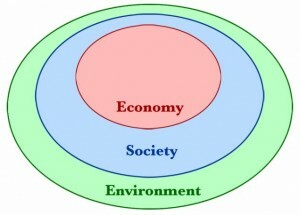 Unfortunately, we as a society are not living within the center balanced region of the model outlined in Figure 1. Many see the economy as the number one priority, followed by the health and social needs of the population with the environment often put last or not considered at all. This actual model of “unsustainablity” is leading us today towards major catastrophes. Examples of these are: the collapse of numerous fisheries, the de-forestation of the tropics and global warming. Many assessment frameworks have emerged in the past decade according to the type of institutions that they try to assess. The following describes a number of these different frameworks. For large corporations, the Global Reporting Initiative (GRI), is a comprehensive and adaptable sustainability framework for businesses of any size. It has many valuable social, economic and environmental indicators. The GRI offers valuable information around the values of reporting, process and boundary setup. Many large companies are now incorporating the GRI report into their annual fiscal report. For large campuses, one of the pioneering frameworks for sustainability assessments was the Campus Sustainability Assessment Framework (CSAF), developed by Lindsay Cole (2003). The framework is currently promoted by the Sierra Youth Coalition (SYC) via their Sustainable Campus Program. 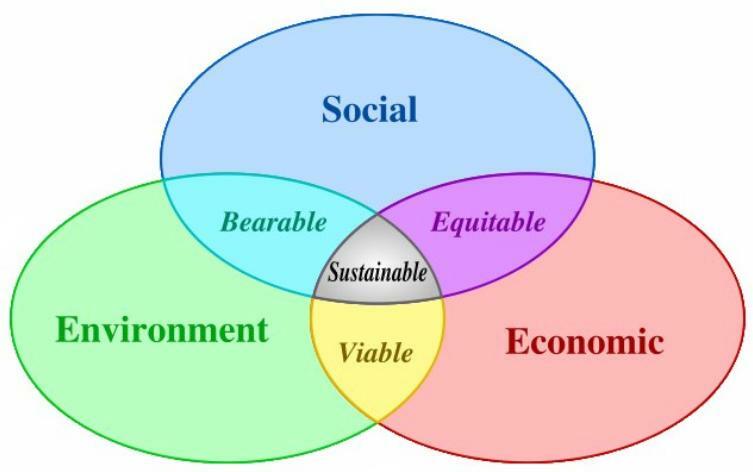 The CSAF structure is based on the nested model (Figure 2) of sustainability. 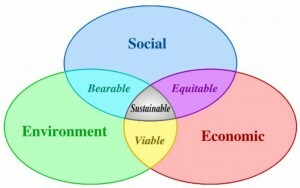 It divides sustainability into 10 dimensions with a total of 170+ indicators. The framework is still considered as one of the most comprehensive assessments for campuses today. However, the CSAF has serious weaknesses. The major one being that many indicators require large time commitments in order to be measured. Also, it does not include a convenient method of presenting the results and comparing with other campuses, or tracking changes over years, as all indicators are measured and reported individually. Finally, the CSAF was written seven years ago and requires updating. The STARS is currently being developed by the Association of Advancement of Sustainability in Higher Education (AASHE). In September 2009, they released their STARS 1.0 framework. The STARS major advantage is its structure. The framework is divided into operational categories, rather than sustainability dimensions, making it easier to determine where to look to find information. It has a point system that quickly shows strengths, weaknesses, allowing comparison and tracking. It focuses more on outcomes than specific strategies, unlike the CSAF. One of STARS weakness is that it does not have a lot of indicators about social well being. Also, the long list of indicators can still be overwhelming for large campuses, such asUBC. UBChas its own set of indicators and sustainability planning documents: TREK 2010, Inspiration and Aspiration, Campus Plan, Climate Action Plan, Focus on People, Aboriginal Strategic Plan, Alternative Energy Committee, and the newly approved Sustainability Academic Strategy. All these strategies and plans developed their own set of indicators and objectives independent of one another.UBCis known for its leadership in sustainability. Our assessment methodology can help to inform the campus community about those strategies and put them into practice at the department level. How can we make assessment a reality for large campuses? UBC is one of the largest campuses inNorth America. The Sustainability office participated in a Pilot project of the STARS 0.5 in 2008 and the exercise proved to be quite challenging: very few indicators were measured. The Sierra Youth Coalition has been promoting CSAF for many years, but no student group atUBChas attempted to use its framework, probably overwhelmed by the size of the task. A series of indicators adapted to our campus. The indicators were selected from the frameworks mentioned in the section: “How to measure Sustainability”. Special attention was paid to the perception of people towards sustainability indicators to identify disconnects between the reality and their perception. Set 3: Indicators relevant for the whole campus, where the sustainability office staff paid / honorarium students could determine (Examples of Set 3 indicators: campus GHG’s inventories, campus wide water and paper consumption, green spaces). The CHBE Sustainability Club has conducted an assessment of our department using the tools developed in set 1 and 2.